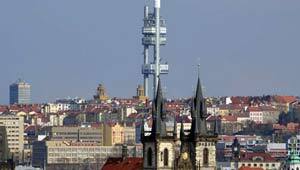 The Prague TV Tower is such a contrast to the historic parts of the city that it has to be seen to be believed. It reminds you more of a soviet missile than a TV tower and the artwork sculptures of babies crawling up it make it even more bizarre. It was completed in 1992, so it’s one of the last legacies of the communist era and it has an indoor observation area and a restaurant/café with the most amazing views of Prague. The public areas look like boxes that have been stuck on the outside of the tower, but inside they’ve recently been totally renovated. The tower now has a new name and is known as Tower Park rather than Zizkov. Apart from the view, the other interesting thing about a visit to this tourist attraction is that it stands in a residential district and offers more of a taste of what the city has been like in more recent years. It’s easy to stay in Prague and spend all your time in the Old Town or Mala Strana and before long you think everything in the city is hundreds of years old. We enjoyed our trip to the TV tower, not just because it’s a fascinating structure, but also because you see a different side of Prague by going there. The observation deck is open daily from 8am to 12 midnight every day. We caught the Metro to get here, line A stop Jiriho z Podebrad. Adult admission is 150 CZK with discounts for students, children & families (2012 prices).